Art-in-the-Office 16th of June 2016 – Container SUMO allocated to an enlightened amateur of the arts! 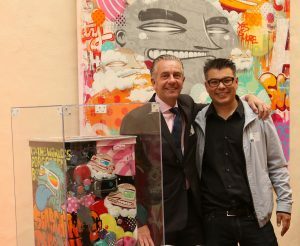 On Thursday the 16th of June, the official preview of the Art-in-the-Office project took place in Contern. On this occasion, the Luxembourgish artist SUMO and the students of the Lycée des Arts et Métiers (LAM) exhibit their artwork which captured the eyes of all present on the evening. Art-in-the-Office, a project initiated by Labgroup and with the support of ALD Automotive, integrates art into the day-to-day working environment of Labgroup’s customers by improving the esthetics of everyday objects like its secure destruction containers. For this first edition, Labgroup called upon a recognized talent from Luxembourg; the artist SUMO. His challenge; to transform Labgroup’s secure destruction containers into artwork. During the official preview of SUMO’s artworks on Thursday, 16th of June, the original container painted by the artist was auctioned. This unique piece of art, has been reproduced on 50 Labgroup secure containers which have been made available to Labgroup’s secure destruction customers. This is the first of three projects that will be realized for the Art-in-the-Office initiative. The auction was won by no other than Bob Kneip, CEO of Kneip Communication, who is a passionate art collector. Furthermore, the guests discovered the projects of the LAM students, created as part of the Art-in-the-office competition, as well as the winner’s project which has been reproduced on a Labgroup container’s. Amongst the 16 projects presented, the student Charlie Diswiscour project was selected by the jury, composed of the artist SUMO, a teacher of the LAM, Bob Kneip (CEO, Kneip Communication) and Romain Poulles (CEO, ProGroup). Unfortunately, Charlie could not be present on the evening but was represented by her father, Luc Diswiscour, who proudly accepted the prize on behalf of his daughter, which was a gift voucher of 500€, offered by Orange Luxembourg. 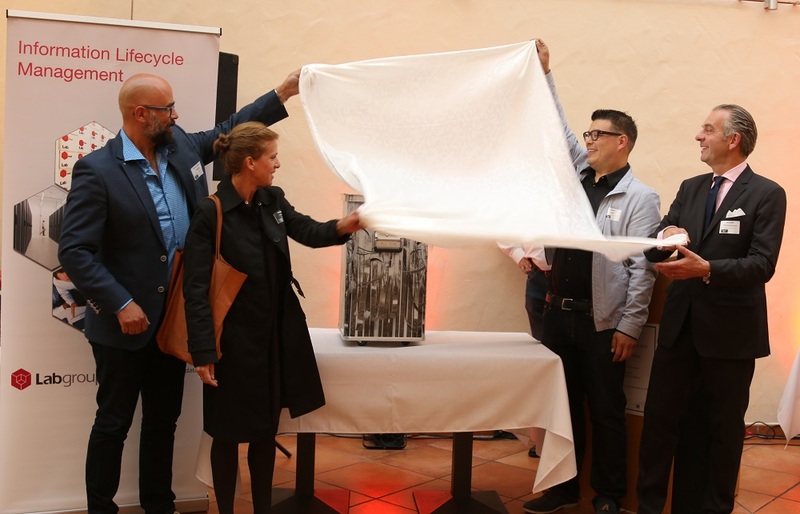 The evening continued in a very artistic atmosphere with a refreshments offered by Gmöhling, the manufacturer of the secure destruction containers. The next Art-in-the-office edition for 2017, will again collaborate with the recognized talent of SUMO and will open the Art-in-the-office competition to a new class of students. The project Art-in-the-office will structure itself next year in form of a non-profit making organization. “Finally, we can say that the project has been a great success. The students of the LAM have created unique and original projects. Every single student has distinguished himself by their own style and has interpreted the subject which was “creation of an original artwork on a container” in a different and unique way. The profession of the expression of shapes and colours allows everyone to express themselves differently. We would like to thank the students as well as the teachers from the Lycée des Arts et Métiers, Marianne Grisse and Patrice Putz who have created as various projects. Even if one unique project has been chosen, we can without any hesitation confirm that all projects deserve a big congratulation. We would like to thank SUMO, with whom we will have the pleasure to collaborate with for the 2017 edition. 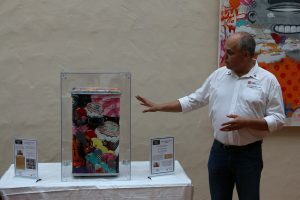 He has created an artwork that is so original and unique, that we were delighted to see Bob Kneip winning the auction of this master piece. Even if we were sad to see this work of art leave the Labgroup building”, Bernard Moreau, CEO Labgroup. “This project allowed me to create an artwork very different from anything I have created previously in my career as an artist. I am glad to have taken this challenge and that I had the opportunity to coach the young artists from the LAM who remembered me of my earlier times as a student in this High-School. I’m delighted that Bob Kneip has won the auction because he admirers and supports the sector of art as much I do. I think it is important to continue to support and encourage this project and I’m looking forward to starting work on the next edition”, SUMO, artist from Luxembourg. https://www.labgroup.com/wp-content/uploads/2016/06/Bob-Kneip-CEO-Kneip-Communications-Container-SUMO.jpg 712 1000 Cindy Reff https://www.labgroup.com/wp-content/uploads/2015/10/Logo-blanc-Labgroup-300x73.png Cindy Reff2016-06-24 07:38:352018-03-21 12:28:47Art-in-the-Office 16th of June 2016 – Container SUMO allocated to an enlightened amateur of the arts! Découvrez l’article portant sur le projet Art-in-the-Office de soluxions-magazine.com paru le 16 juin 2016. Via Art-in-the-office, Labgroup introduit l’art dans le quotidien de ses clients en améliorant l’aspect esthétique de ses conteneurs de destruction sécurisée. Art-in-the-office. Ou comment introduire l’art dans l’environnement de travail par le biais d’objets utilitaires. Initié par Labgroup et supporté par ALD Automotive, ce projet triennal fait appel, pour cette première édition, à l’artiste luxembourgeois SUMO. Son défi ? Transformer les conteneurs de destruction sécurisée Labgroup en œuvres d’art ! Le vendredi 3 juin, tous les acteurs qui ont contribué au succès du projet Art-in-the-Office, ont pu admirer en avant-première le fameux conteneur peint par SUMO. À la fois pratique et artistique, son œuvre a été reproduite sur 50 conteneurs et mis à disposition de clients Labgroup dans leurs locaux. Art-in-the-office, a three-year project launched by Labgroup and with the support of ALD Automotive, integrates art into the day-to-day working environment by improving the aesthetics of everyday objects; for this first edition, Labgroup called upon a recognized talent from Luxembourg; the artist SUMO – his challenge, to transform Labgroup’s secure destruction containers into artwork. “This project unites two conflicting concepts: destruction and creation. The creative element consists in the conception of an original artwork displayed on a container, which is ultimately destined to collect material for the purpose of destroying it. This paradox constitutes one of the fascinating aspects of the artwork. In addition, my works are typically composed of several layers, whereby each successive layer destroys the previous one” stated SUMO. Art-in-the-office – AN ARTISTIC INNOVATION IN LUXEMBOURG! Labgroup integrates art into the day-to-day life of its customers by improving the aesthetics of its secure destruction containers. Art-in-the-office, a three-year project launched by Labgroup and with the support of ALD Automotive, integrates art into the day-to-day working environment by improving the aesthetics of everyday objects. For this first edition, Labgroup called upon a recognized talent from Luxembourg; the artist SUMO. His challenge; to transform Labgroup’s secure destruction containers into artwork. « This project unites two conflicting concepts: destruction and creation. The creative element consists in the conception of an original artwork displayed on a container, which is ultimately destined to collect material for the purpose of destroying it. This paradox constitutes one of the fascinating aspects of the artwork. In addition, my works are typically composed of several layers, whereby each successive layer destroys the previous one. », SUMO. Charlie Diwiscour, Winner of the AITO 2016 edition. On Friday 3rd of June, all actors which have contributed to the success of the project Art-in-the-office, could admire a preview of the famous container redesigned by SUMO. Both aesthetic and functional, his artwork has been reproduced on 50 containers which have already been made available within the offices of Labgroup’s customers. 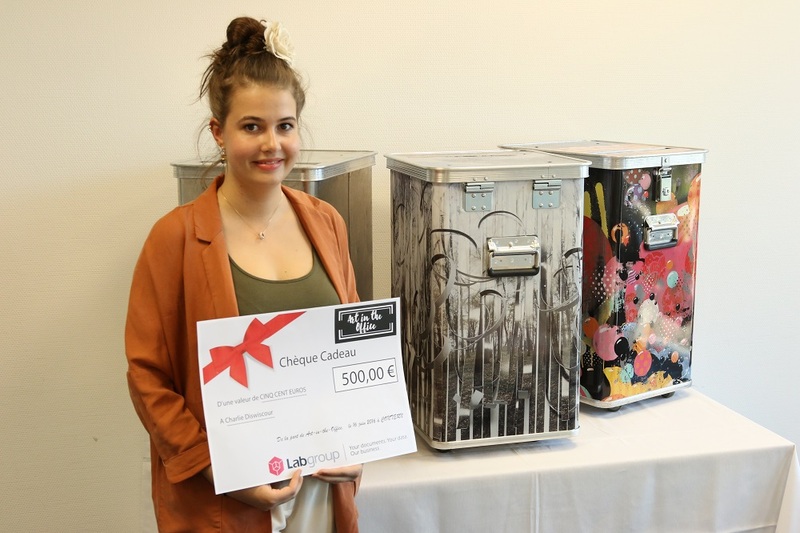 The event gave the occasion for the students of the Lycée des Arts et Métiers (LTAM) to present their artworks which has been created as part of the Art-in-the-office competition: 16 unique and creative projects, amongst which a competent jury will have to choose the artwork that will be reproduced on Labgroup’s containers. The name of the winner will be announced during the exhibition which will take place this Tuesday 16th of June, by a jury composed of the artist SUMO, a teacher of the LTAM, Bob Kneip (CEO, Kneip Communications) and Romain Poulles (CEO, ProGroup), both passionate collectors and admirers of art. 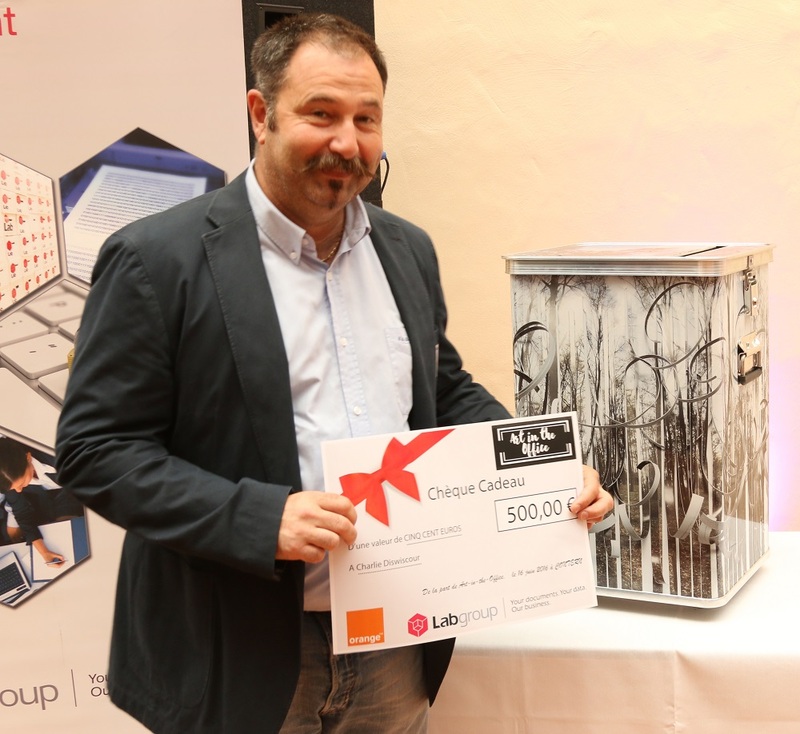 The winner will receive an award, offered by Orange Luxembourg. During this event, the auction of the SUMO container will be closed (see www.artintheoffice.org), before the closing drink offered by the company Gmöhling which produces the secure destruction containers. The next Art-in-the-office edition in 2017 will again request the recognized talent of SUMO and will open the Art-in-the-office competition to a new class of students. The project Art-in-the-office will be structured itself next year in the form of a non-profit making organisation. « The importance of the social role of art is often underestimated and discouraged by our society. Labgroup wants, via Art-in-the office, to support this sector of the expression of shapes and colours. We aim to integrate art into our daily lives as well as the daily lives of our customers. On the one hand, it is a way of thanking our customers for their trust, on the other hand, it is a way to remember that art has no limits. Artistic expression accompanies us every day and can be found even on the most common objects like our Labgroup containers. The collaboration with SUMO was logical since he does not limit his art to paintings. », Bernard Moreau, CEO Labgroup. Labgroup is a Luxembourg-based company that offers information management and archiving services to businesses in the financial and insurance sectors and to administrations and businesses from other sectors. Labgroup’s range of services includes digitising paper documents, storing and destroying physical archives, capturing and conserving electronic archives, protecting and restoring data, preserving IT media and giving consulting services and training. Labgroup also has offices in Ireland and Gibraltar. As a Financial Sector Professional (PSF), Labgroup is monitored by the Luxembourg Financial Services Supervisory Authority (Commission de Surveillance du Secteur Financier, CSSF). Labgroup is ISO 9001 and ISO 27001:2005 certified and will soon acquire PSDC status. https://www.labgroup.com/wp-content/uploads/2016/06/IMG_8862-cut.jpg 575 794 Cindy Reff https://www.labgroup.com/wp-content/uploads/2015/10/Logo-blanc-Labgroup-300x73.png Cindy Reff2016-06-17 06:59:242017-10-04 15:36:13Art-in-the-office – AN ARTISTIC INNOVATION IN LUXEMBOURG! Découvrez l’article paru dans l’édition de Mai de Soluxions Magazine sur la digitalisation. Dans une optique d’amélioration continue des services offerts aux étudiants, l’Université de Luxembourg a choisi de numériser les dossiers de l’ensemble de ses étudiants. 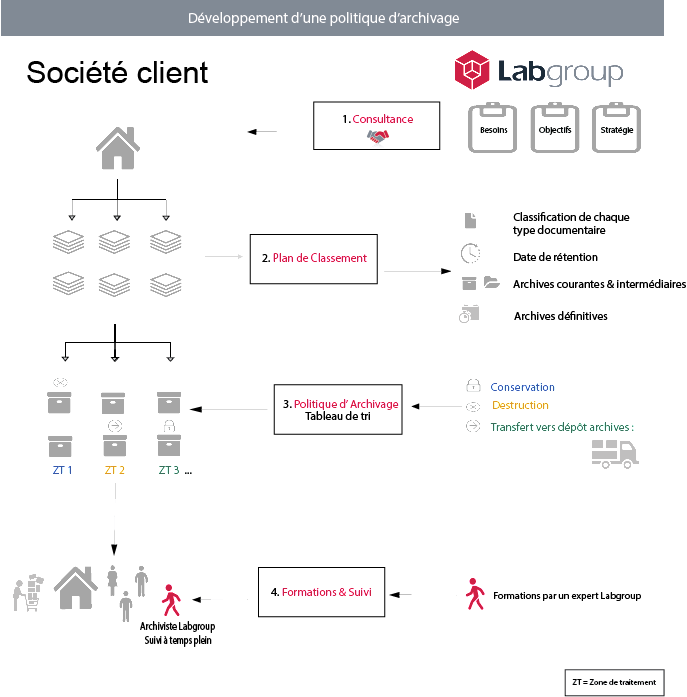 Partenaires technologiques du projet, Numen Europe et Labgroup. Engagée dans un processus de digitalisation au long cours, l’Université de Luxembourg numérise ses dossiers étudiants. Et sera, selon ses partenaires technologies, Numen Europe et Labgroup, une des premières organisations labellisées PSDC Prestataire de Services de Dématérialisation ou de Conservation), telle que définie par la loi du 25 juillet 2015 relative à l’archivage électronique. La Loi du 25 juillet 2015 sur l’archivage électronique et la dématérialisation a positionné le Luxembourg. Mais, par-delà les aspects législatifs, par-delà aussi les opportunités économiques pour les futurs prestataires, quels gains -concrètement- retirer de la dématérialisation ? Bernard Moreau, CEO, Labgroup, et David Gray, General Manager, Numen Europe, avancent différentes pistes de réflexion. Découvrez la conférence “Cycle Information management & Entreprise 2.0” animée par Jean Racine qui se déroulera le 27 octobre 2016 de 14h à 17h15 à NEIMËNSTER. Le nouveau cadre juridique européen et luxembourgeois favorise la transformation digitale des entreprises en aplanissant la voie vers un business sans papier. Aujourd’hui c’est la journée internationale des Archives ! Une occasion de remercier ceux qui facilitent nos recherches et échanges d’information…. An opportunity to thank the ones that ease our researches and information exchanges… Today is the International Archives Day! Cette journée internationale place les archives au centre de l’attention en démontrant qu’une bonne organisation de la circulation des archives pendant leur cycle de vie est importante. QU’EST-CE QU’UNE ARCHIVE ? / WHAT ARE ARCHIVES? Les archives sont des documents de différents types, de différents supports et de différentes périodes qui découlent de l’activité des organisations. Outil de bonne gestion et de gouvernance, elles sont conservées comme preuve ou témoignage du passé. Elles fournissent à la fois des preuves, des explications et des justifications aux actions et aux décisions passées et constituent des bases pour celles du futur. L’optimisation de l’utilisation et la conservation de vos archives permettent d’améliorer votre efficacité et de rester « compliant » à tous les niveaux de votre activité quotidienne. Perçues comme un challenge pour les organisations, les archives représentent une plus-value. Archives are documents of different types, age or support that are produced by an organization as part of an activity. Defined as being a management and governance tool for businesses, archives are witnesses of past events. They provide evidence, explanation and justification both for past actions and current decisions. The optimization of the day to day use as well as the retention schedule of your archives improve your efficiency and enable to stay compliant. Mostly considered as a burden rather than an asset, archives represent an added value to your business. Cette nouvelle loi reconnaît la valeur probante des copies électroniques de documents papier, dont elle autorise donc la destruction, et instaure le statut de PSDC (Prestataire de Services de Dématérialisation ou de Conservation). Les archives électroniques créées et conservées par une entreprise certifiée PSDC, bénéficient de la valeur légale d’original”. This new law acknowledges the probative value of electronic copies of paper documents that therefore allows their destruction, and creates the PSDC status (Dematerialisation and Archiving Service Provider). The electronic archives, created and maintained by a certified company, benefit from the same legal value as the original document. La théorie des trois âges des archives est une notion fondamentale de la gestion du cycle de vie des archives. Chaque archive depuis sa création jusqu’à la détermination de son sort final (destruction ou conservation) traverse ces périodes : les archives courantes, les archives intermédiaires et les archives définitives. The Three Ages Theory is a fundamental notion enabling the management of the lifecycle of archives. Every archive from its creation to determination of its end (destruction or retention) goes through those periods: active, semi-active, inactive. 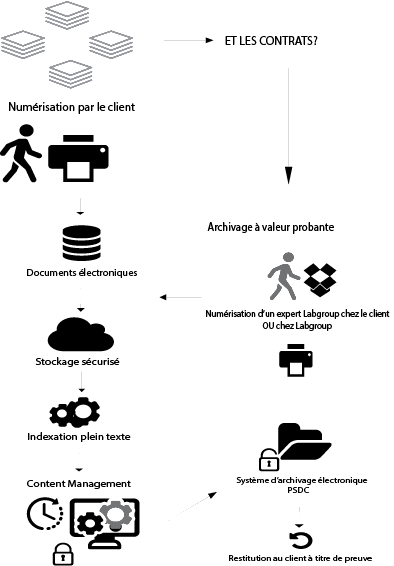 Gérer la confidentialité et la communicabilité. Copyright © 2016 Lab Luxembourg SA, All rights reserved. Découvrez l’article “L’université du Luxembourg dématérialise ses dossiers d’inscription” paru sur le site www.solutions-numeriques.com le 16 mai 2016. Créée en 2003, l’UNI, l’Université du Luxembourg a lancé un projet de numérisation des 20 000 dossiers d’inscription de ses étudiants. Avec 6 200 inscrits, l’UNI est une organisation confrontée comme bien d’autres à la gestion des archives papier. « Ce projet a commencé il y a quatre ans, et le point essentiel a été de numériser toute notre chaîne d’admission étudiante, afin de dématérialiser les 20 000 dossiers d ‘inscription que nous recevons chaque année. La principale difficulté a été de trouver le bon partenaire, d’organiser le changement au sein du Service des Etudes et de la Vie Etudiante de l’Université. La résolution des points principaux s’est d’abord portée sur la définition claire et partagée des processus de dématérialisation, ensuite sur une exigence renforcée de qualité des documents d‘inscriptions avec une communication la plus effective au candidat à l’admission, et enfin sur la numérisation rapide et le transfert des fichiers image en temps réel sur nos bases de données », explique Eric Tschirhart, vice-recteur académique de l’Université et initiateur du projet. Numen Europe et Labgroup ont accompagné l’Université tout au long du projet, en triant et traitant plus de 3 millions de pages d’archives papier, soit 670 mètres linéaires, et en mettant en place une chaîne logistique intégrée et sécurisée (transferts des documents et des données, dématérialisation, conservation des copies électroniques, destruction des documents papier). « Tous les maillons de la chaîne ont été conçus pour garantir la fidélité de la copie électronique à l’original papier pour les différents formats de documents (cartes d’identité, diplômes, documents A3, A4, etc. ), et l’impossibilité d’altérer son contenu pendant le processus et le transfert vers le système d’archivage électronique », indique David Gray, General Manager de Numen Europe. Découvrez l’article “Services académiques à numériser” paru dans le magazine de Paperjam, Mai 2016. “Engagée dans un vaste projet de digitalisation depuis 2008, l’Uni veut doper l’efficacité de ses processus. Le chantier central est la numérisation des dossiers étudiants, étape vers la création d’un «one-stop shop» pour toutes les démarches. Numen et Labgroup, ses partenaires technologiques, lui assurent un niveau de qualité «PSDC», une première au Grand-Duché.